The School of Dragons needs a leader who commands respect and is unafraid in the face of danger. 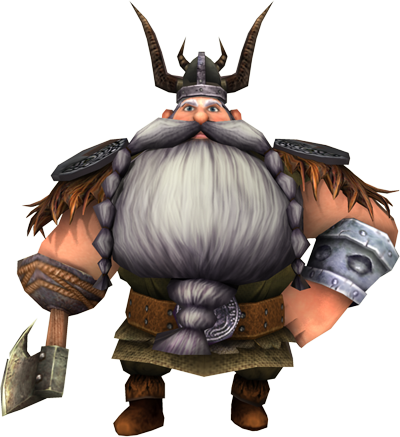 Luckily, the school’s Headmaster is a legendary warrior in Berk. In his younger years, he was known as Heyral the Bloodthirsty, who fearlessly defeated countless dragons. As word of his valor spread, many claimed to have witnessed dragons flying away in fear whenever they saw him on the battlefield! In addition to defending his village from dragons, Heyral led many seafaring expeditions to find the dragon’s nest of legend. Although he came back empty-handed each time, his final expedition was not only a failure, but it put an end to his career. While he never spoke of what happened on that trip, rumor has it that the Headmaster discovered a nest of baby Deadly Nadders. Though the dragons were his mortal enemies, he could not bring himself to put down innocent hatchlings. Ashamed of his own weakness, he laid down his axe after the journey and retired. Despite his vow to never fight dragons again, fate had different plans for Heyral. Years after his retirement, news of Hiccup’s innovative approach to taming dragons reignited his interest in these winged creatures. During his time as a dragon slayer, Heyral had also developed invaluable insight into the strengths, weaknesses, and biology of dragons. This knowledge made him the top candidate for the role of Headmaster at the School of Dragons. The Headmaster sometimes comes across as a strict teacher who demands nothing but the absolute best from his students. However, new students should know that his severity comes from his experience with dragons. The Headmaster is aware that danger lurks around every corner, and he wants to ensure that his dragon trainers will be ready to take on any challenge that comes their way.